Container gardening is one of the most popular ways to cram in as many flowers and edible produce into as small space as possible. If you have a small garden, or your only outside space consists of a balcony or patio, in many ways the containers you plant up will be just as aesthetically important as the flowers, vegetables or fruit that go into them. Whilst standard shop-bought terracotta and glazed pots are pleasant enough, you may want to opt for something a little more individual or eclectic. Making your own pots and planters from recycled materials is one great way to create bespoke and unique designs on a small budget. It's vital that any items you choose for containers are adequate for growing plants in. They'll need to have drainage holes at the bottom, to avoid the soil becoming too waterlogged. If there are no holes, you will need to drill a few in with a power drill. All containers will then need a layer of coarse material at the bottom, Broken clean crocks, broken polystyrene, chipped slate or gravel will all be fine. The planters can then be potted up with compost as usual. There are almost an endless amount of recycled items that can be used as pots and planters. A visit to a salvage yard, antique shop or thrift store can inspire a wealth of ideas for containers - from old chimney pots, wooden barrels, wooden toolboxes and even old leather boots! Old metal watering cans are popular, as are redundant bicycles and their baskets. Metal or plastic buckets can also be used to plant in, as long as they have drainage. You could also think about using ceramic materials. Old Belfast-style sinks and even porcelain toilets and standalone baths have been sunk into the ground and used as pots and planters! Similarly, smaller items like teacups and ceramic bowls can also make interesting planters. Another great way to integrate recycled materials into your garden is to use spent large tins and pots. If you can get your hands on the wholesale size metal oil drums (available from food co-operatives, cash and carry stores or larger supermarkets, or ask around at restaurants and cafes), they can make fantastic pots and planters. Foreign packaging designs can be bright and fun, and the containers will not only look cheerful, but also rust and age in a very interesting way. 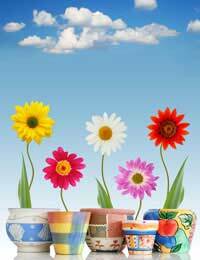 Why not test any burgeoning art skills and create your own pots and containers. Kiln-fired clay can be left outside and is a perfect natural material for pot planters, as it allows the soil to 'breathe'. Whilst small pots can be crafted in clay at home, you might need to join an evening class to have access to proper pottery equipment. But acquiring a new skill such as pottery will give you free abandon to create your own unique and tailor made pieces, as well as giving you access to glazing and firing techniques. And you never know, your new hobby could turn into a new business venture! Alternatively, you could always try sprucing up existing pots. You could try painting terracotta pots in Mediterranean colours, or designing your own motif. Mosaic designs are one way to recycle old materials into something new and one of a kind. Blank terracotta pots are ideal, but because they have a porous surface they'll need sealing before you mosaic them. This can be done with a layer of concentrated PVA glue and a paintbrush. Make sure you allow the PVA to dry before you start your mosaic. For the mosaic pieces, you can use old porcelain plates, pots or cups and glass tiles but you will need to make sure that they're small enough to go around the curve of the pot. This means that you may need to take a hammer to your tiles and porcelain - safety glasses can be worn in case of any flying splinters - to create small tile pieces no larger than ¾ inch. To stick the tile pieces to the pot, you'll need a fairly strong adhesive like 'No More Nails'. Once you've stuck all the pieces to the pot and you're happy with your design, you'll need to leave the adhesive to set overnight. After this time you'll be able to grout the spaces between the tiles with waterproof tile grout to complete your homemade mosaic pot plant.